Midwest Products has been selling high quality balsa to modelers for a very long time - since 1952 according to their website. 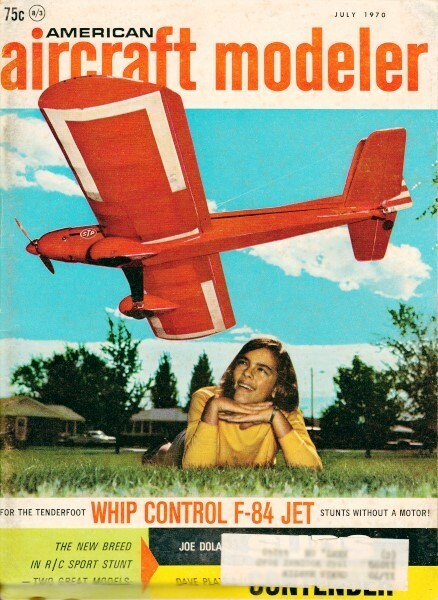 Theirs and Sig's are the two names that come to mind when I think of balsa, since they dominated the market back in the 1960s and 1970s when I first started building airplane models. Balsa USA and the many house brands sold by hobby distributors are now available, but Midwest and Sig are still to balsa what Coke and Pepsi are to soft drinks, at least to many my age (54) and older. 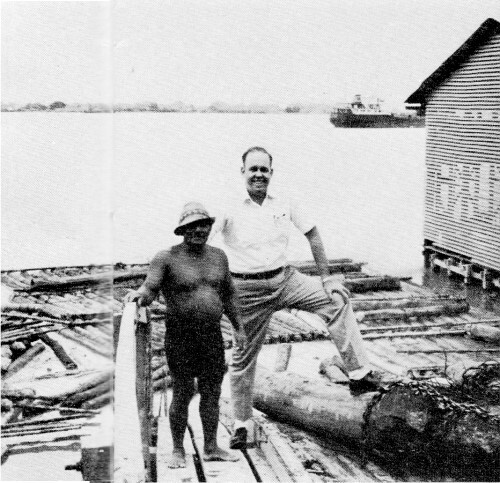 This story from the July 1970 edition of American Aircraft Modeler recounts an expedition by Mr. Frank Garcher, of Midwest, to the Balsa Ecuador Lumber Corporation, in Guayaquil, Ecuador. 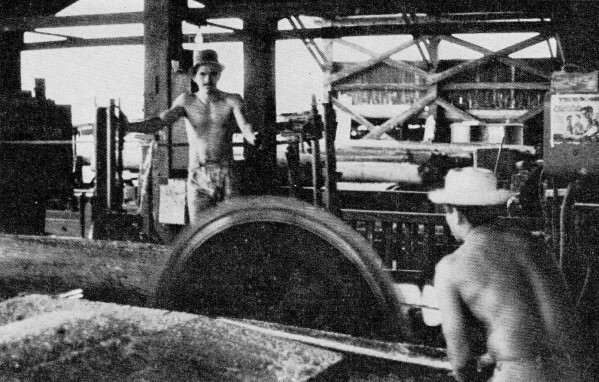 A search of Balsa Ecuador Lumber did not turn up any results, but I did find a modern-day mill called Lumber Industries, in Samborondon, Ecuador, in case you want to see an example of how your balsa is processed today. Deep in the jungle at midnight a boy pretended to be sick, and there was a ritual of wild-looking feathers, evil brown liquid, and weird incantations. After 20 years of waiting, the day, July 20, finally arrived to leave for Ecuador. Sam Grober was to be my traveling companion for the next seven days on a most fantastic trip. Sam speaks Spanish and German, and I constantly called upon him to let me know what was going on. We flew to Miami and picked up a Braniff International jet for Guayaquil, Ecuador. Making a short stop at Panama to change pilots and crew, we arrived at Guayaquil at 8:00 p.m. and met Jean and Jacques Kohn, owners of Balsa Ecuador Lumber Corp.
At 7:00 a.m., the bellboy brought essence of coffee, a black syrup that you pour cold in your coffee cup, about 1/2 inch deep. Add hot water and you have the greatest wake-up stimulus. Our day ran from 7:00 until midnight, but the next morning I was sure to be wide awake after that first cup. Breakfast usually was fresh pineapple slices, with pieces of lime that you squeezed over them - a new taste sensation. We then ate ham and eggs (at least that's what they said on the menu) and this started our day. Jean and Jacques Kohn, the two brothers who own Balsa Ecuador Corp., were to be our hosts for the next five days. The trip from the hotel to the mill is about a 10-minute ride - if you keep your eyes closed and don't watch the driving. With your eyes wide open it is a laugh a minute. I think the driving motto down in Ecuador is "keep 'em between the buildings." Frank and a mill hand. The Balsa Ecuador's mill. Logs float down river as rafts. Saw blades are two to three feet in diameter. 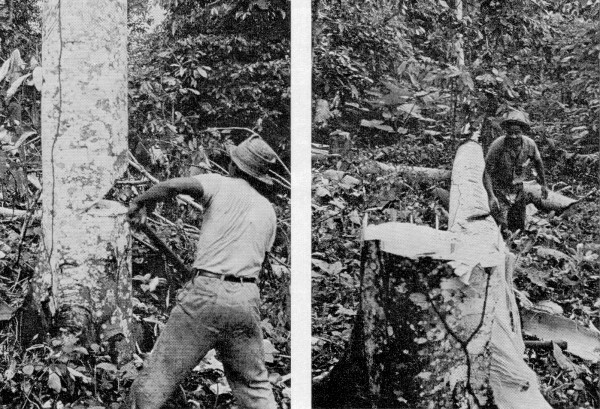 Left: It takes only 90 seconds to fell a balsa tree as big as this one. Right: Bark is removed by machete. At the mill, we spent two days going over all the specs for the balsa shipments to Midwest. We covered all the mill operations, from the logs coming down the river to the mill, forming huge rafts, to the final shipments to our plant. The logs at the mill were 9 to 12 feet long, very green and wet. Also very heavy. The logs were then cut on a head saw and are very wet to the touch. After the log is cut to 3 1/4 to 3 1/2 in. 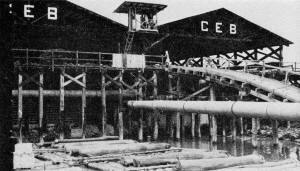 thickness, the wood must be hand-stacked in uniform stacks on flat rail cars to be rolled into the kilns. The kilns are really giant steam heated ovens that bake out the water to dry out the wood. If this is done too fast, the logs come out of the kilns with internal checks and splits that can be spotted only when cut. The amount of hourly records kept on each load of wood and the consistent checking to insure quality amazed me. The logs cut yield only about 10 to 15% usable wood for model airplanes. Eighty-five percent of the log must be put into the industrial grade. Without this amount being used by industries other than model people, the price of balsa wood would be prohibitive. At the airport on Wednesday, we waited over an hour for our pilot to arrive in a Piper Cherokee. I wasn't sure it could handle all the weight, but the pilot and Sam, through translation, convinced me that we should go. The flight into the jungle was like a ride over a solid green carpet. You see nothing but banana and balsawood trees. We landed at the airport, an oily strip just wide enough to get down and get off again. A banana plantation owner gave us a tour, showing us how bananas are processed for shipment to the United States. During dinner Wednesday night at a motel, the only one for 300 to 400 miles in the middle of the jungle, Jean asked us if we would like to take a ride into the jungle to see the Colorado Indian medicine man perform the rites on a sick person. So Jean informed one of the boys that he would have to be sick and go through the ritual with the medicine man! I knew it was going to be wild, for a light rain was beginning to fall. We drove out of town for about 11 miles, then stopped by the roadside. Walking through hilly terrain, we started down into a valley 100 to 150 feet below. Steps were carved into the hillside. By this time it was 11:00 p.m. and with only one flashlight, getting dimmer by the minute, I heard a roar that indicated water was rushing by. When I asked one of the fellows how we proposed to get across this roaring torrent, he pointed to two logs, side by side, flatted on the top, approximately 10 to 15 feet above the water. Before utter panic hit me, I started across, reaching the center before the logs started to vibrate like a tuning fork, as the second man started to cross behind me. I was ready to return home - right now! Still vibrating at the same frequency as the logs, we made our way up the other side of the hill to the medicine man's hut. After conferring with him and having to take a drink of his white lightning, he sent us back across the stream to his friend. The trip back across the logs was something to remember as I fell when I reached the other side. I was safe and almost dry. It now was 12:15 and we had to wake up the medicine man and his family. This didn't set too well with them, but the sight of Jean's money brought a sparkle to his eye and he brought out his family from the hut. Inside the hut, which was approximately ten feet square, there was a small table in the far corner. Two candles and some wild looking feathers made into a duster lay on one corner of the table. Toward the front of the table were two bottles of a vile looking liquid and a wooden cup. 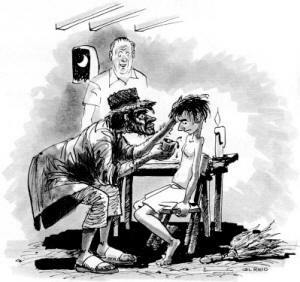 Our boy who pretended to be sick, was instructed to take off his shirt and relax as the medicine man rubbed his chest with the oily liquid. Mumbling a few words in a chant-like tone, he proceeded to beat the feather duster vigorously on the boy's chest and back. The medicine man then poured a brown looking liquid into the cup and gave it to the boy to drink. If anyone who was not sick drank out of this cup, he'd be sure to catch something when he left. It was like going back to the 16th century. The following morning we drove further into the jungle, on dirt roads. We visited a school built by two Catholic priests who process balsa wood, having constructed eight classrooms and a small church from the proceeds, right in the middle of the jungle. After touring the different balsa areas we drove back to Guayaquil on a new four-lane highway. Upon completion, this road will run from Quito, the capitol, to the port city of Guayaquil. Jacques had made arrangements for our flight to Quito on Tame Airlines. Quito, about 9000 feet above sea level, is located on a mountain top and must qualify for the title of Las Vegas of South America. Needless to say, a few hours on Saturday night were spent at the tables. Sunday was spent going to the monument that shows where the equator is, taking pictures and visiting the numerous tourist shops and old churches. Sam and I met a small Franciscan friar who gave us a tour of the oldest cathedral in Quito. Putting my 14-size foot in my mouth as usual I said I would like to go to the top of the bell tower to look out over the city. I thought we would climb the steps inside the cathedral, but the other two had different ideas. We started up the outside of the building and over the roof tops to wind up some 80 feet above the ground. I am at home behind the stick of a Schweitzer I-26 at 5000 feet, but swaying in the breeze 80 feet above the ground is for the birds! After turning in my mountain-climbing equipment, we boarded a jet for home. I would like to express my gratitude to Balsa Ecuador Lumber Corp., Jacques and Jean Kohn, and especially to Mr. Sam Grober who made this trip one of the highlights of my 24 years in the balsa wood business. Their patience and fortitude showing me around was a great benefit.